Harald Krueger's handling of steep job cuts while BMW's global head of human resources earned him support from the Quandt family and labor unions. 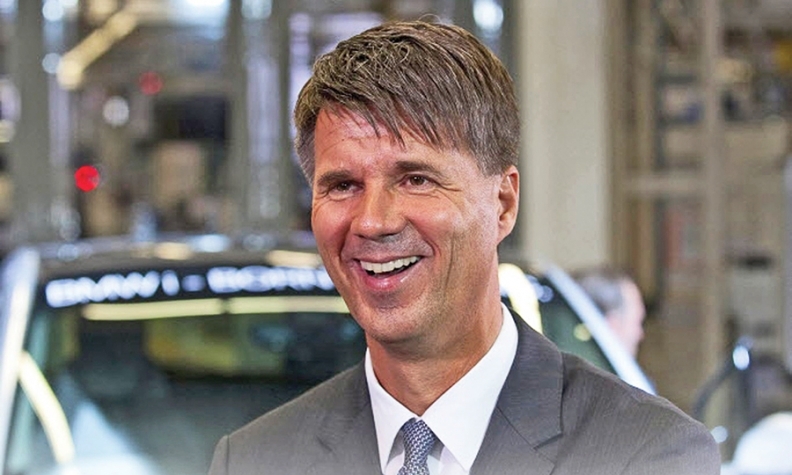 Boyish looks and affable smile aside, Harald Krueger remained largely a blank slate for BMW shareholders gathering in Munich's Olympic Hall last week to get a glimpse of the new chief executive. The 49-year-old mechanical engineer sat patiently on the podium during the annual general meeting, waiting for outgoing CEO Norbert Reithofer to finish his speech about the challenges and opportunities facing his successor. Krueger, a Black Forest native and father of three, was not mentioned by name. Sources close to the supervisory board say that wasn't coincidental. Since Krueger won the top job in December, BMW has shielded him as much as possible from the limelight. Outside of spending time with his family, his hobbies are largely unknown. One of Germany's leading newspapers even incorrectly reported which German soccer club he supports -- no small screw-up. Influential business publication Manager Magazin dubbed him the "master of the noiseless ascent." After stints in Germany, the U.S. and U.K., Krueger joined BMW's management board in 2008 where he was first responsible for personnel, and later for the Mini brand as well as production. BMW sources say Krueger is a charismatic consensus-builder, and that's what won him the top job. Unlike Volkswagen's survival-of-the-fittest management school -- propagated by recently deposed Supervisory Board Chairman Ferdinand Piech -- BMW's culture has little place for alpha wolf egos seeking the spotlight. Instead, the cadres of executives who rise through BMW's ranks are schooled in the same art of understatement as the scions of the Quandt family who control it. Krueger was chosen over former BMW development chief Herbert Diess, who takes charge of the VW brand in July. Smooth handling of a sharp reduction in the work force had much to do with it. As personnel chief during the recession, Krueger had to cut BMW's employment by 4.6 percent. And he did it with "decency and integrity," said one insider, while also implementing a state-subsidized scheme to cut working hours and thus preserve other jobs. That helped gain him important allies, namely the unions. As production boss beginning in 2013, Krueger oversaw the expansion of the global plant network including adding capacity in Spartanburg, S.C., and laying plans for a factory in Mexico. Krueger caught the eye of the BMW board as director of the Hams Hall engine plant in England -- a post he held from 2003 to 2006. "After BMW sold Rover, suddenly there was this enormous factory left over," said a source. "Krueger completely restructured the place; he integrated it into the BMW engine manufacturing network and saw to it that it can still exist today." Krueger is entrusted with delivering the sixth straight year of record profits at BMW and preserving the independence of the world's only pure-play premium carmaker. He personifies the company, according to company insiders -- a type of anti-Piech for an anti-Volkswagen. "He is not a manager who polarizes or runs headfirst through walls," said one official close to the supervisory board. "Krueger knows how to motivate colleagues -- a prototype of the new management generation." The source said it was Krueger's ability to unite factions within the group that most impressed the two key stakeholders tasked with deciding Reithofer's successor -- the Quandt family and the unions. Krueger had been a leading candidate for the post since he helped guide BMW through its first-ever round of mass job cuts, winning the respect of labor leaders in the process. "He was the only one that had majority support," said the source. "The other candidate [Diess] could not be sold to labor and failed to gain the backing of the works council." While outdueling rivals in an internal fight for resources was a key trait for VW's Piech, Chris Donkin, a partner at management recruitment firm Korn Ferry, said Krueger's qualities made him an ideal fit for the changing nature of leadership. "The hierarchical command-and-control structure, where the CEO bangs his fist on the table is becoming less effective," said Donkin. "It's increasingly at odds with the requirements of today's far more complex industry. Now you must inspire people rather than intimidate them."